I spent an evening recently in the charming village of Moira, once celebrated throughout Goa for its delectable variety of bananas. The primary purpose of my visit was to photograph the imposing village church. Remains of ancient Hindu temples, which had been partly or wholly built of basalt stone, can still be detected if one explores the three Old Conquests thoroughly. During a survey of the monuments of Goa from August 1964 to January 1967, I found many an image or architectural fragment of basalt stone from ancient Hindu temples either built into churches or lying discarded near them. One of these finds was the tripartite linga of god Siva from the razed temple at Moira (Bardez). I discovered this in the church at Moira where it was being used as a stand for the holy water basin. I removed the linga and took it to the Museum of the Archaeological Survey of India in Old Goa, donating a sum of money for a new water basin for the church. The following exquisite scene presented itself a little before sundown. I was hoping to frame the church façade against the cobalt blue sky – a tiny window available moments before the onset of complete darkness. 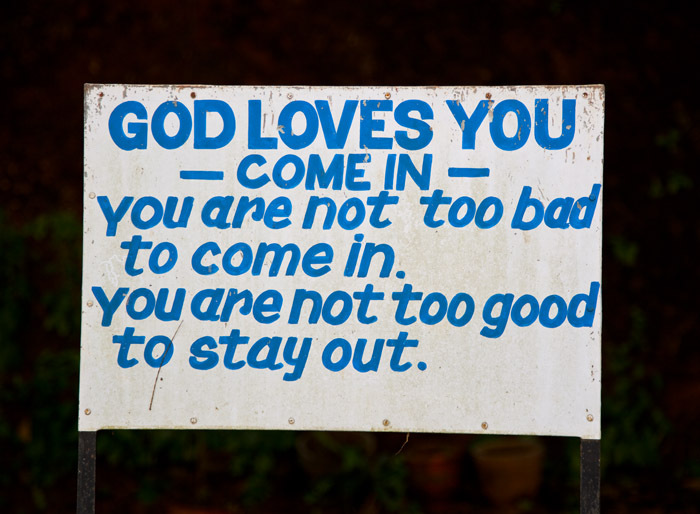 But in Goa the best plans can go awry. As I waited in anticipation, a neon lamp operated by the Electricity dept came to life imprinting on one flank of the church the shadow of an intermediate tree, as seen below. Thank you. My 14 year old says that you make it look even more beautiful than in real life. I remember climbing up to the belfry to help the sancristan ring the bell. lovely light, you’re particularly good at capturing the various hues of sunrise and sunset in Goa. Brahma, Vishnu and Shiva constitute the Trimurthi of the Hindu pantheon. Of the three, Brahma the Creator is the odd one out: He has less than 10 temples dedicated to Him alone in the whole of India. The puranas ascribe this anomaly to a curse inflicted on Him by Lord Shiva. The Brahma temple in Pushkar, Rajasthan, is well known. Not as well known is the temple at Carambolim (also called Brahma-Karmali) in northeast Goa. The idol worshipped here is an 11th C masterpiece of scuplture. 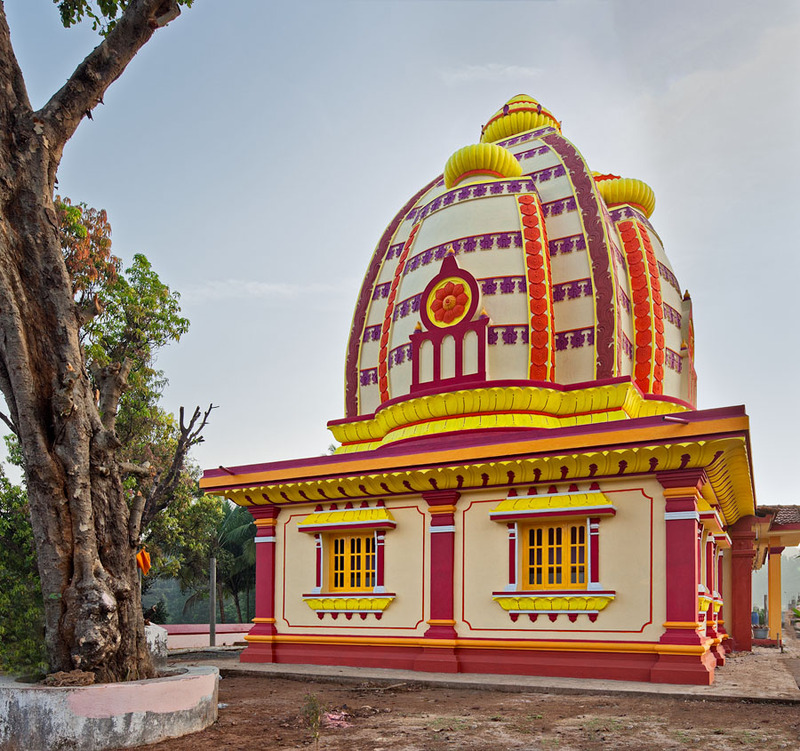 The Brahma temple in Goa was originally located at Carambolim (Karmali) near Panjim. 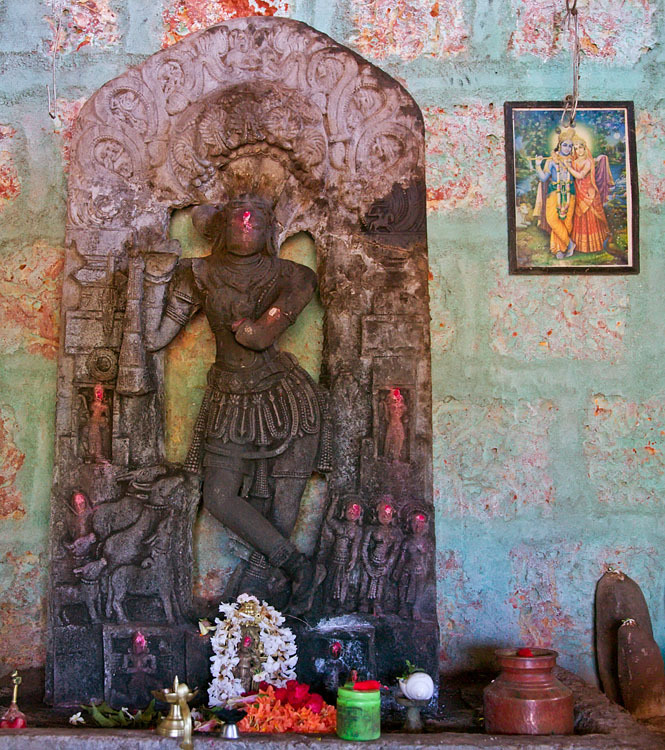 After its sacking by the Portuguese in the 16th C, the idol was moved to its current remote outpost and re-consecrated. Later, in a nod to its original home, the area around it came to be known as Brahma-Karmali. The stone sculpture of Brahma from here is one of the best specimens of Kadamba art. 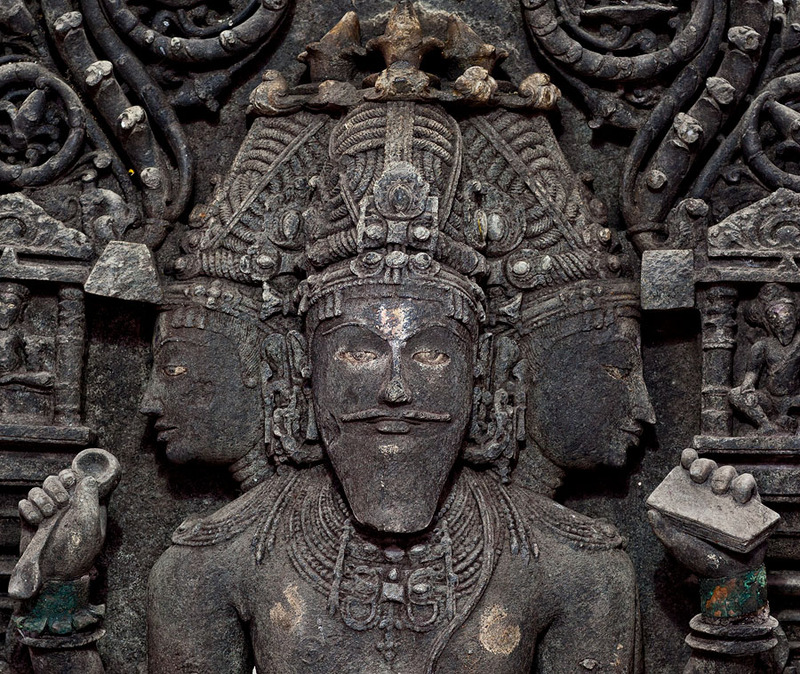 Like Brahma from Sopara, the stone sculpture of the Carmoli Brahma has a beard on the central face. The sages were supposed to have a beard. In this respect Brahma is similar to them. 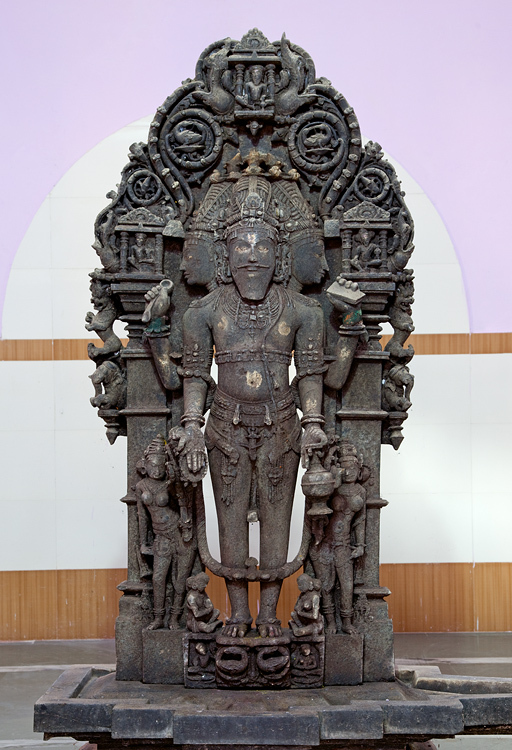 Brahma in his front right hand is holding chanting beads (akshmala) and the hand in the blessing pose (varada) and in the rear right hand he is holding the sacrificial ladle (sruka). In the front left hand he is holding ghee pot (ajya-sthali). In the rear left hand he is holding a book (pustaka). 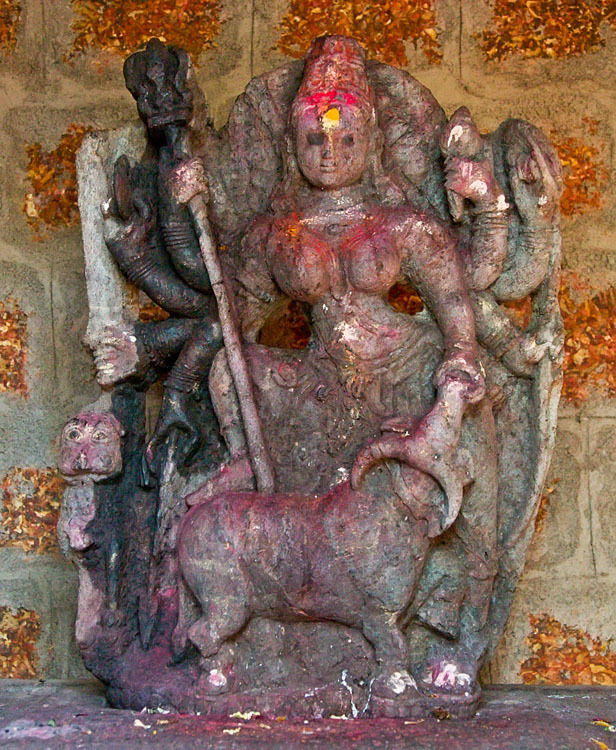 The consorts of Brahma, Savitri and Saraswati are shown standing on either side of Brahma. Three small niches found in the intricate torana are housing tiny images of the deities. The central niche has Ganapati, Vrishabhavahanashiva is in the right hand side niche and Vishnu is found in the left hand side niche. 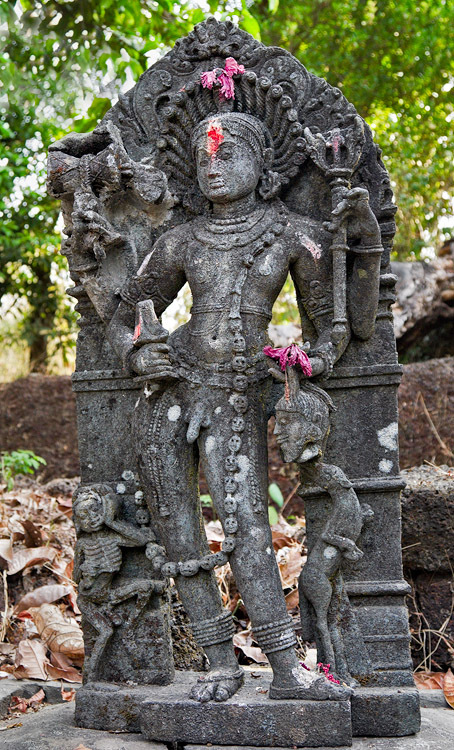 There are other ancient Brahma images in Goa worshipped in subsidiary shrines in the villages of Parsem, Virnoda and Colomb. A striking Brahma head also figures in the museum collection in Old Goa. The Carambolim temple recently got a complete makeover. These photographs were taken in November 2009. 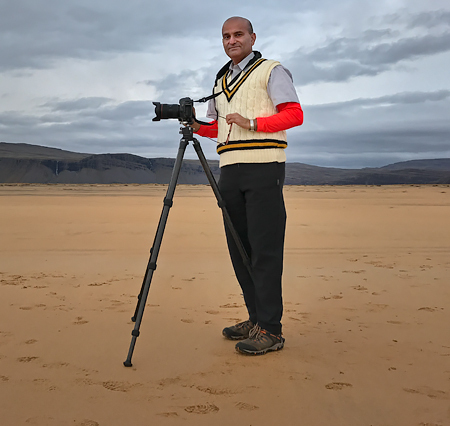 After searching for nearest possible Bramha’s temple than one in Rajasthan, I found this Rajan’s site…; I appreciate his efforts of beautiful photography. I am Local resident of the same place but according to me this place is not yet been developed as it should have been as far as presence of such a brilliant sculpture of Lord Brahma is concern. Hi Nice to know from the net. I wish to introduce myself to you. I have over 27 years experience with reputed builders in Mumbai, who have developed / are developing malls, hotels, IT Parks, luxurious residential Towers/Townships, etc. I am also a leadership trainer exciting entrepreneurs/intrapreneurs to achieve their cherished goals. I wish to meet you to introduce MVT California, which is growing exponentially in India software, which can empower you to promote your products through audio-visual streaming video webmail, webconferencing with your clients and webcasting of new products, properties, etc, without the other side having the same software. Furthermore, since millions will use this in India, there is a very big mind-boggling earning potential in the years to come. Kindly call Mr. Mathew George for details on 0 9322858180 for details and give us an opportunity to meet you in Goa..
FRANCIS SEQUEIRA, 9/3/17, Highland Park CHS Ltd, Bhavani Nagar, Marol Maroshi Road, Andheri (E), Mumbai 400059. A fittingly colourful abode for the Creator of the universe. This statue of Brahma depicts a much younger version of the Creator I know, that of the Old Testament. But then Hinduism does pre-date the Mosaic traditions. Shubha Mudgal has established herself as one of the leading Hindustani Classical vocalists of the current generation. She is also fluent in other musical genres. 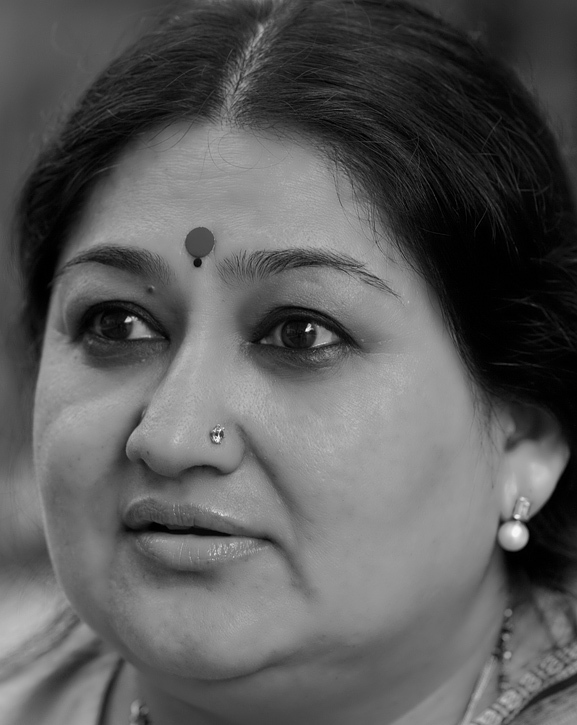 Shubha and I share a common guru, the late Ramashreya Jha “Ramrang.” A not-so-well-known fact about Shubha – her father was Skand Gupt, the outstanding cricket commentator of yesteryear, whose distinguished voice and Hindi diction are remembered by AIR listeners of the 1970s and 1980s. These portraits were taken in Mumbai in December 2009. It is nice to see somethin about Shubhaji. The year I came to the department she had already passed but my sister who was doing masters in English lit. She had Jaya Gupta her teacher and hostel warden as well. 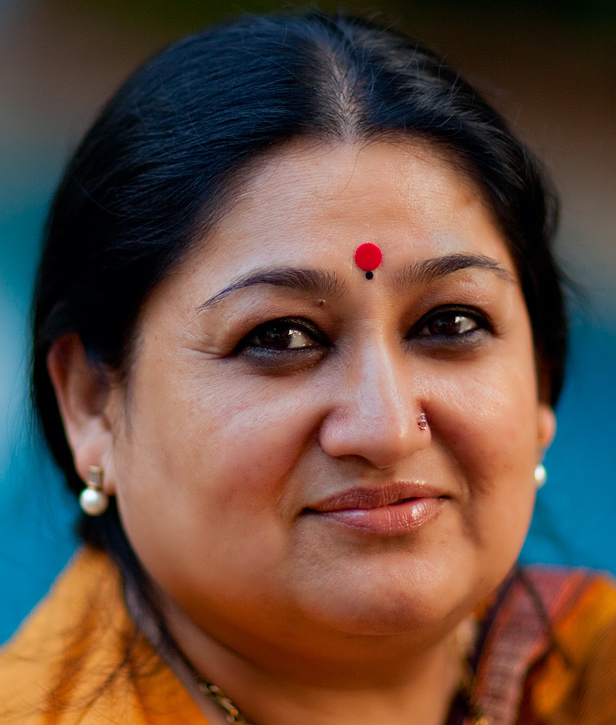 She told me a lot of stories of Shubhaji’s practice sessions in the campus. 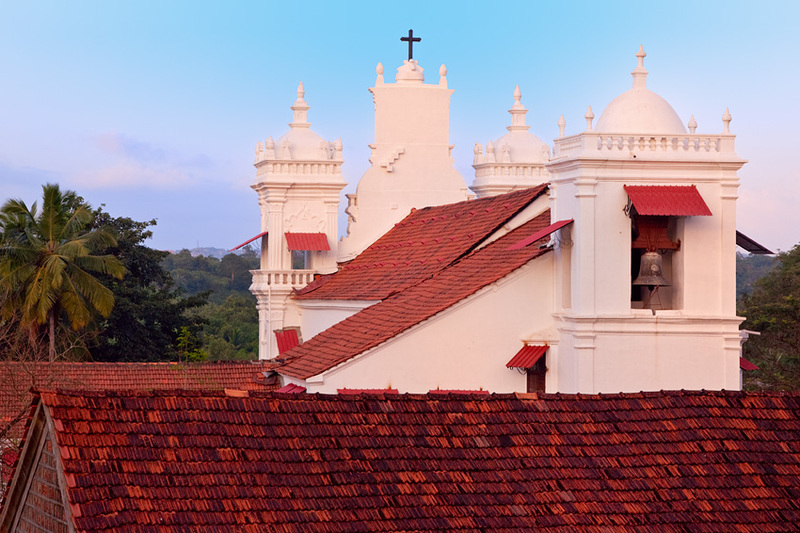 No visual symbol distinguishes Goa from the rest of India quite as tellingly as its capital city of Panjim, perched on the banks of River Mandovi. 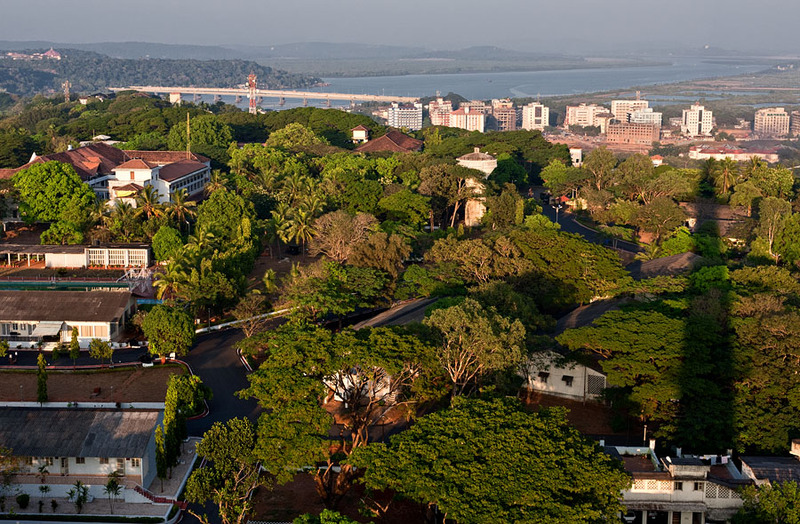 Panjim attained prominence in 1827 when the Portuguese transferred their capital from Old Goa. 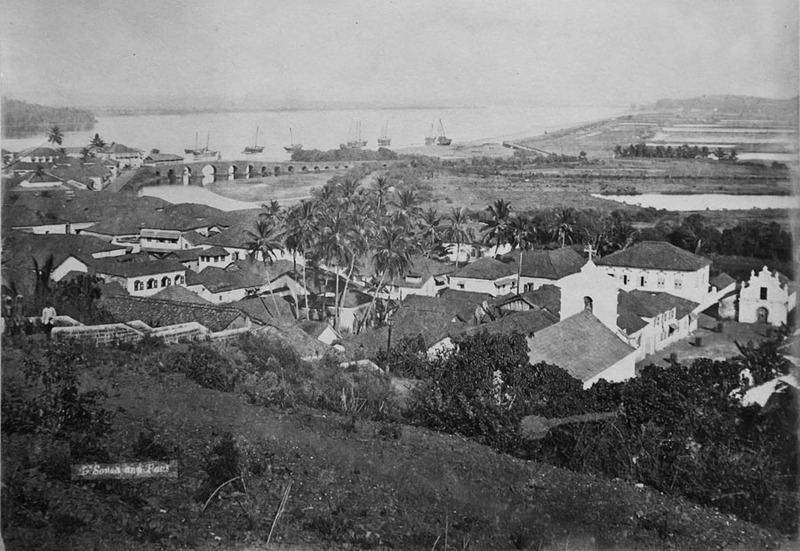 In 1843, it was elevated to a city, awarded upgrades befitting the capital of Estado da Ìndia, and renamed Nova Goa. A description of that time cuts a smart picture: It is a very beautiful city, modern, with broad and spacious roads drawn in grid pattern (tiradas a cordel), large squares, excellent footpaths, six beautiful bridges and a fine dock. That quote and its source are found in the monograph Snapshots of Indo-Portuguese History – Part I – Pangim, by Vasco Pinho. I was born and raised in Panjim. It remained essentially the same idyll through my young adult years. All the ingredients of a world-class town were in place beginning with its picture-postcard setting. It was clean, quiet, the pace was languid, and an old world collegial ambience prevailed. Violent crime was unheard of. It had fine educational institutions, an outstanding medical school & hospital – said to be the oldest in Asia, a superb Central Library, a clutch of cultural institutions, lovely jardims, and wide open spaces for outdoor activities. Above all, it was a pedestrian’s delight with all neighbourhoods within the ambit of a leisurely stroll. Where in India – or even in Silicon Valley for that matter – could a young fellow sit through a music class, then go out and shoot soccer balls, then polish off a plate of bhaji-puri at the legendary Cafe Tato, then traipse across the jardim to the reading room at Central Library, and finally pedal to Miramar beach for sundown? All in the space on an afternoon, immersed in delightful surroundings, without jostling crowds and honking traffic. Panjim was our cosy nest for what the Italians call dolce far niente. This is not a tall tale of “the good old days” – I am talking Panjim of as recent as the mid-1990s. 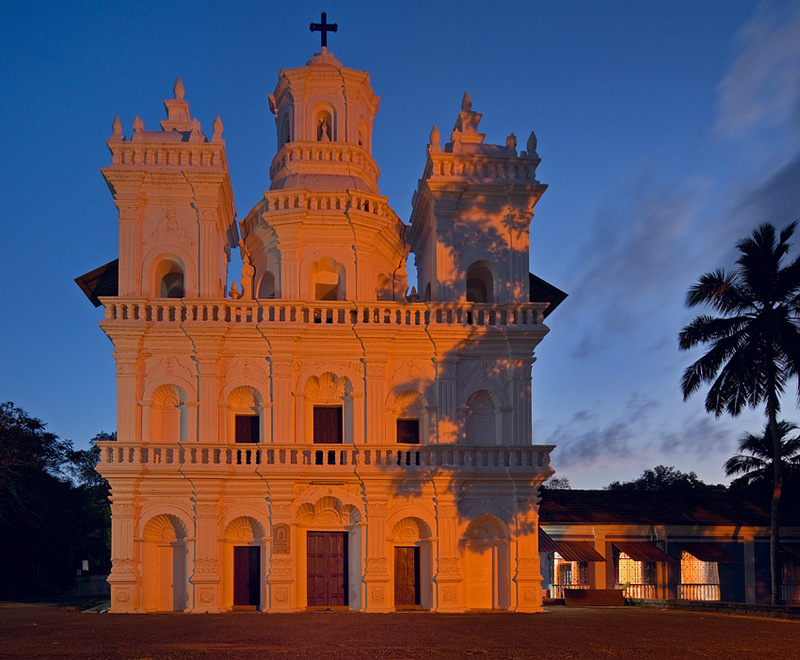 Sad to say, since 2002 or so this exquisite city of ours – amchi Ponje – is on a downward spiral like much of Goa. Soon it will devolve into another noisy, squalid, jumbled mass of urban chaos that is characteristic of all Indian cities and towns. By and by I shall have more to say on this. In this extended series to be run over the next several months, I will focus on remnants of Panjim‘s past. The photographs will strive to convey a sense of the city’s surviving heritage assets and its (fast-fading) character. One final note before we head to the gallery – the book, Walking In and Around Panaji (2005), put together by Heta Pandit is a good starting point for an exploration of Panjim and surrounds. This first photograph was taken from the Reis Magos fort across River Mandovi. 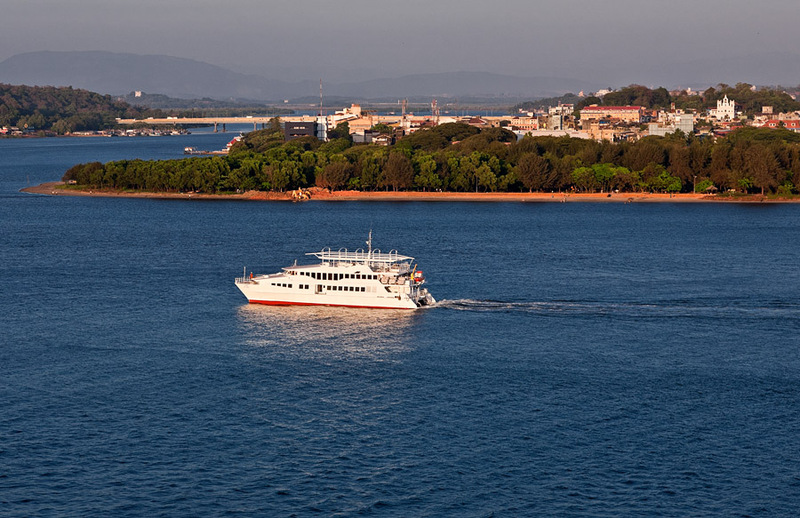 The next photograph was shot late evening from the upper maintenance deck of the Doordarshan tower (notice the long shadow), looking towards Patto, Mandovi bridge, and the island of Chorão across the river. I had to obtain special permission for access to the tower. The climb up the dark, dank space was quite hairy given the heavily corroded iron railings & stairs. By way of comparison, this is a photograph I took of an old (c. 1900) photograph from the Central Library archives. The bridge leading into Ponte de Liñhares (1632) that joins Panjim with Ribandar is seen, as are the salt pans to the right, and Chorão across the river. The final photograph was taken in Corte do Oiteiro (colloquially called Cortim). 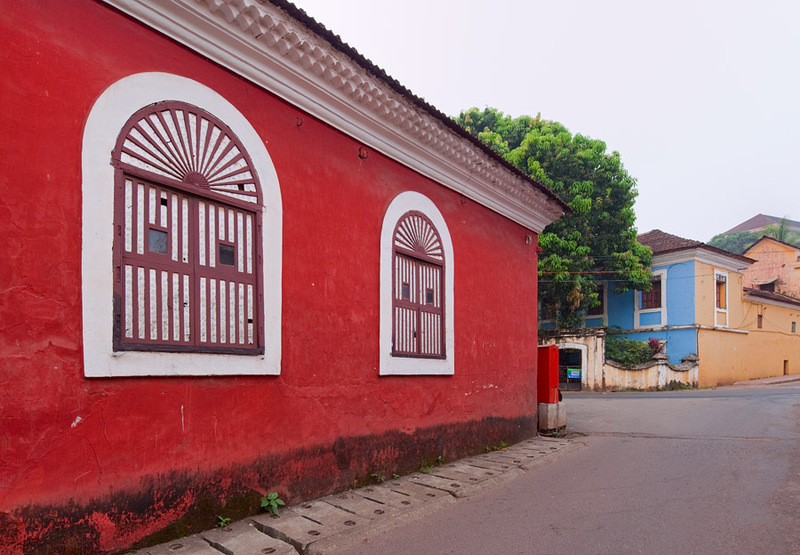 Houses of this type, featuring windows laced with nacre, characterize Panjim‘s old quarter. Hope this Goan beauty and Goan architecture is preserved forever. This entry is motivated by the following news item in the January 6, 2010 edition of the Goan daily Herald. This willfull destruction of Goa‘s cultural heritage has become commonplace now that the disease of mindless ‘development’ and ‘modernization’ has firmly taken hold. Exquisite old temples built by our traditional gavandis (masons) are being torn down to make way for hideous concrete designs, magnificent sculptures of great antiquity are being cast out in the wilderness with no understanding of their significance. I remember the day I got to the beautiful village of Netravali (variously spelled Netorli, Neturlim) in south Goa almost two years ago. Feeling unwell that morning, I was about to call it a day but then I remembered the cardinal rule of photographers: take the shot when you can. I was to appreciate the value of that piece of wisdom on more than one occasion in India. And so I quickly worked on the 4 ancient sculptures in the vicinity: Gopinath, Kalbhairav, Mahishasurmardini, and Ganesha. The glorious image of Kalbhairav out in the open forest was especially striking but it was backlit at the time. I resolved to return soon for a repeat session. When I came back a couple of months later, the idol was gone! A brand new one had been consecrated. I don’t know where the old Kalbhairav is. 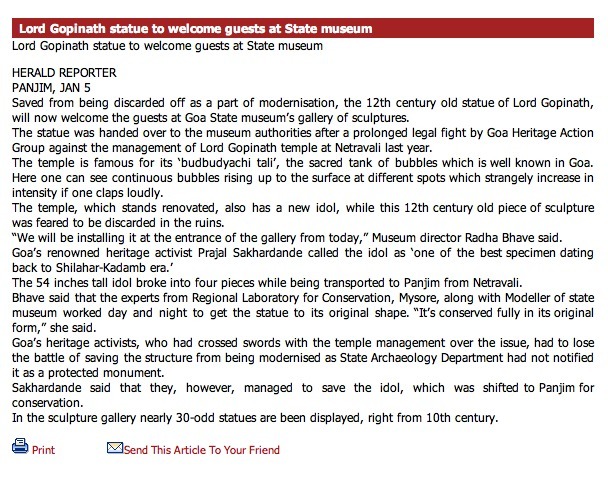 Hopefully, the Goa Heritage folks will retrieve it as well. These treasures are said to date back to 9th-10th century C.E. from the time of the Southern Shilaharas in Goa. Awesome depiction of Bhairav. The gaze is so compelling and very calm. 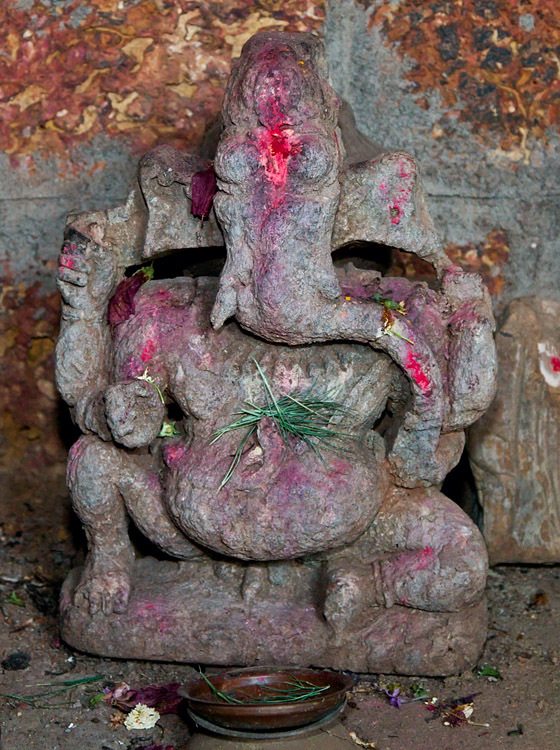 Quite an unique elongate headed Ganesha. Good capture of the pigment dispersion. And frankly I like that their phalluses are not hidden. Superb page.